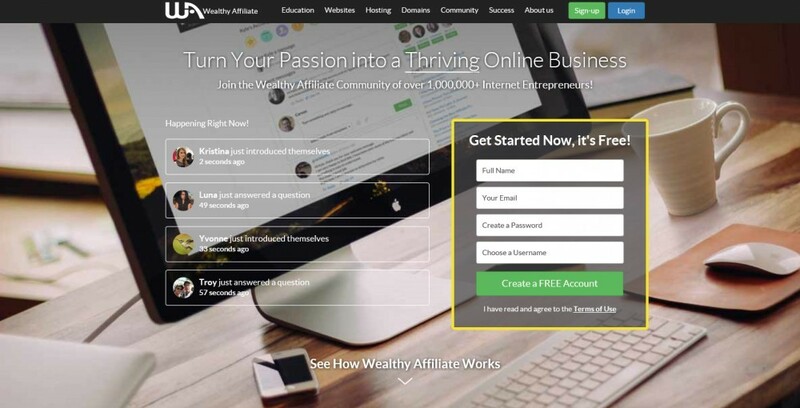 Wealthy Affiliate is an Internet marketing company whose main products include website hosting, website registration, a stand-alone keyword research tool called Jaaxy, and an ongoing Internet marketing training platform. I liked the fact that you can try it for free. Not only can you try it for free, they don’t collect any payment information at all until you’re ready to join so you don’t have to worry about anybody charging your card without permission. You can also choose to promote the company without paying any kind of membership fees at all. Of course there are way more benefits to being a paid member, like more hosted sites, your own domain, free access to Jaaxy Lite, double commissions, and access to more training, but yes, you can promote this business without investing a dime. Wealthy Affiliate can easily be the only business you promote because it has value, great services, and great compensation. However, you can choose not to promote it and still make money by using the training and services to promote other businesses. For example, I registered ComCapU.com to help people make money, but I also registered a fitness site to profit from the health industry. On top of that, one of my favorite hobbies is playing the Xbox One, so I registered a gamer site as well. If I’d wanted to, I could’ve chosen to make money promoting fitness and video game products without ever mentioning money-making opportunities. Wealthy Affiliate makes it possible to make money from literally any industry you want to get into. Wealthy Affiliate did for website setup what Microsoft did for computer software. They didn’t invent it, but they made the user experience so easy that you enjoyed using their system over everyone else’s. I was using Host Gator for web hosting before I joined Wealthy Affiliate. One of the most irritating things I had to do was set up WordPress on their server. They had a web based method that was supposed to simplify it. It was too slow and confusing trying to figure out where to put all the usernames so I ended up downloading WS FTP Home to speed it up. Faster, yes, but it could still be confusing at times, and it was hard trying to remember my password because WordPress has complicated requirements for their passwords to make sure no one gets hacked. With Wealthy Affiliate, you literally just click one button and WordPress is set up for you. You also get the option of logging in through the system so you don’t have to remember your WordPress password. Attrition is when the people you sponsor quit or cancel their memberships. It’s the biggest problem Internet marketers have to face, which is partly how I found Wealthy Affiliate in the first place. I started noticing patterns after being in so many business opportunities over the years. I noticed that, regardless of what business I promoted, there were certain tools of the trade that I had to have. I was in and out of about 10-15 businesses during my first 3 years of Internet marketing, but the one thing that remained constant during that time was that I needed a web site to promote whatever business I was in. The web hosting fee always got paid regardless of what business I was promoting. I needed a way to register those web sites and then I had to find a way to do keyword research after Keyword Planner got taken off the web by Google. I also realized that even though the Internet can be a great source of income, it can also be a quick way to lose money if you don’t know what you’re doing, so I needed steady training. And finally, let’s not forget about the need to follow up with prospects. Later, I had the bright idea to build a business around those products and services because I needed them regardless of what business I’m promoting. A few Google searches later, I found an article about Wealthy Affiliate and all my needs had been answered. 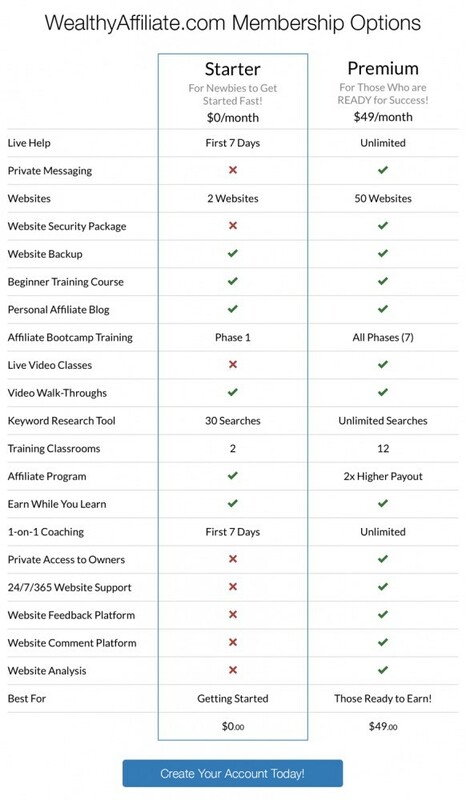 That’s training, web hosting, registration, and the best keyword research tool on the market, in one place. Does this make sense to you? As Internet marketers, these services are must-haves. The only reason to ever cancel is if your client isn’t making enough money. So if you refer people and help them accomplish their goals, there’s never a reason to cancel their memberships regardless of whether they promote the same business for 10 years, switch businesses every two months like I used to do, or just run a personal blog that they have no intention of making money from. It doesn’t matter. Your income would just keep growing. The Wealthy Affiliate system revolves around creating content for a blog, be it written or video. This content is then used to generate traffic, which ultimately turns into sales. Social media like Facebook, Twitter, and Instagram are great for generating traffic. The thing I don’t like is that you never get a break from it. When you stop promoting on social media, your traffic goes way down. Also, everything you put on social media belongs to the owner of that site, so if you post a video on YouTube, it belongs to YouTube and they can close your account whenever they want without giving you notice. A former business associate of mine lost his account because one of his competitors went through his account and flagged every video for no reason. YouTube closed his account. Every video was lost. I’ve heard horror stories of stuff like this happening with Facebook and Instagram as well. With Wealthy Affiliate, every article you write is still yours. Every video you upload belongs to you. On top of that, you learn how to get good ranking on Google. If you can secure a good ranking for a good keyword, it’ll turn into a steady supply of leads from one piece of content, which doesn’t happen with social media. Don’t get me wrong, social media is still great for traffic generation, but use it together with what you learn from WA to make things easier to sustain over the long run. Wealthy Affiliate is only 1 of 2 money-making programs that I cannot think of anything negative to say about. If I really wanted to nitpick just to have something to write is this area, I could complain that it isn’t network marketing.That’s a good thing for some people, but I like network marketing because it’s a great way to leverage your income, meaning you make money off your personal sales as well as your team’s sales. But honestly, if I wasn’t just nitpicking for the sake of having something to write in this section, I really wouldn’t have anything to write. I have no complaints. The keyword research tool, Jaaxy, has it’s own review because it’s a stand-alone product that used to be sold separately for $49 per month. Then one day, out of nowhere, the owners decided they’d be serving us better by giving it to us for free since keyword research is a vital part of Internet marketing and some people couldn’t afford the extra $49. That shows they really care about our success, and it was the moment when I decided to give Wealthy Affiliate my all. You can’t fail with that kind of leadership. This is the main product. You get 25 hosted websites under the siterubix.com domain and another 25 websites that can be registered as their own domain name, which are probably more than you’ll ever need. You can also expect certain features that usually cost extra to be included at no extra charge with WA, like SSL security, high speed, and spam blocking that actually works. I was using Go Daddy before I found WA. I save about 50% on every registered website because domain privacy, which costs an extra $14 on Go Daddy, is free with WA. There is a library of banners to choose from in whatever shape or size you may need. Stats are kept day to day including a section for you to view all of your referrals and set the messages sent to them automatically upon joining. This is most important out of the bunch because none of those other services mean anything if you don’t know how to use them. You get access, as a Premium member, to all the training you’ll ever need. Some of it comes from the owners, Kyle and Carson; and some from other members. The owners are marketing geniuses. I highly recommend listening to whatever tips they give. I’m a little skeptical about taking advice from the rest of the community unless I know what level of success they’ve achieved. It’s nice having an army of entrepreneurs eager to help you, but some just aren’t qualified to help you so I’d recommend you start by referring to the training lessons when you need help. If that doesn’t work, contact your direct sponsor. You’ll have access to an Affiliate Certification course that will teach you everything you need to know to be successful with affiliate marketing. You’ll have access to an Affiliate Boot camp that’ll teach you everything you need to know to market Wealthy Affiliate successfully. Once a week, usually Friday at 8PM EST, you’ll get access to a live training. There are also virtual classrooms and live video classes that go deeper in depth about various marketing topics, like getting started, how to use WordPress, how to write content, social media marketing, email marketing, and SEO (search engine optimization). Here’s a video I took of me asking the community a question. The answer I got kept me from making a big mistake that could’ve cost me rankings on Google if I hadn’t had access to this training system. Support is very fast. I haven’t had many issues, but when I do, someone always gets back to me within an hour. How Can You Make Money with Wealthy Affiliate? The 1st way is to promote the company. The compensation plans are covered below. The 2nd way is to become a Premium member and make money by creating training content. This option is available after you’ve been Premium for 3 months. Kyle and Carson can choose to pay you for quality training content that helps the company grow. The 3rd way is to follow the 4 Step process (shown below) to create a website and use it to make money doing pretty much whatever you want to do. $1 for all Free members that you refer as long as there’s a 1:5 upgrade to paid ratio. Payouts are made via PayPal once per month. You can set your minimum payout to anything from $10-5,000. There are no up-sells but you do get the option to save 39% by getting a yearly membership. To be perfectly honest, when I first learned of Wealthy Affiliate, I knew I still wanted to make money online, but I wasn’t sure if I wanted to do it in the money-making industry. After all, you don’t have to be in the money-making industry to make money even though a lot of network marketers try to make it seem that way. At first, I was trying to decide between joining my friend’s MLM company, promoting a group-funded crypto-currency business, or promoting a fitness site. Wealthy Affiliate wasn’t even a consideration for a while. I registered websites to set up blogs for each business. I needed web hosting for each of the websites that I registered. I did keyword research for each blog post regardless of the business. All roads kept leading back to Wealthy Affiliate no matter what I did. That’s when the choice became obvious to put some effort into Wealthy Affiliate because I’m an Internet marketer, I need their products anyway, and it just makes sense. And to help you get off to a great start, after you’ve joined, I’m going to give you access to the 23 Step Blog Post Checklist that Wealthy Affiliate marketers have been using for years to turn our sites into profitable authority sites. Just send me a private message asking for it after you’ve created your free account. Click here for a free Wealthy Affiliate account. Did you enjoy this review? Are you currently a member of Wealthy Affiliate or considering joining? I like to hear from my readers. Use the Comments field below to tell me what you think, and if you got any value from this review, please Share it. Sorry about the misunderstanding, but the company does pay $1 per free sign up as long as there is a 1:5 (or 20%) upgrade ratio to the paid version. I will update it now so there’s no confusion with anyone else in the future. Thinking out loud, let’s say that I pay $49 and you get 24.50, leaving the company with 24.50. And let’s ignore credit card processing fees. Yes, with Wealthy Affiliate, you have the option to create your own custom capture pages as well as custom sign up links and tracking links. WA does not offer an autoresponder at this time. Aweber and Get Response are the industry leaders. If you’re not already a member, use the link on this page to join. I’ll be happy to tell you where to find a service that’s every bit as good as Aweber, but costs way less. LaShaun, I agree with your comment “All roads kept leading back to Wealthy Affiliate no matter what I did.” because I keep seeing it over and over whenever I do a google search for this or that! In your case, I was searching for reviews of FES. One question: what about capture pages and autoresponding? and creating tracking links? Does WA offer that? You’re absolutely right, Dave. The leadership at Wealthy Affiliate is amazing. The most selfless I’ve ever seen in online marketing or anywhere else for that matter. I was also in the habit of trying one system after another to make money with online but I have to say it was a struggle to find something sustainable. The thing is, most programs out there just want to be the only ones benefiting the most, unlike wealthy affiliate which aims at helping you grow and succeed as that makes them succeed as well. This is exactly what made me join wealthy affiliate, their selflessness. I agree, Cathy. Wealthy Affiliate is a great way for newbies to learn how to make money online and great for experienced people too. I haven’t been here as long as you but my opinion and experiences with Wealthy Affiliate are the same as yours. Hi there. I’ve been a member for almost 4 years now and I can vouch that the platform is one of the best investment I’ve ever made. My background isn’t in IT or marketing, so the learning curve for me is pretty steep. Yet now, I’ve become comfortable using WordPress and also helping others build an online business for themselves. What was once a foreign subject, I’ve come to like all aspects of online marketing and the benefits that it could bring for creative individuals or local brands. There’s always something new to learn on Wealthy Affiliate while you grow your income. It’s a legitimate platform that rewards significantly if you are accountable for your own action taking. I totally agree. It’s awesome and so easy to follow. One of the best systems I’ve ever seen. I love this post. I am a member of WA and The longer I am here, the more I enjoy it. It is such a great feeling to learn things you never thought you would be able to do. The training and the community of experts are awesome! Hi, Arie. Thanks for the response. The first bit of advice I’d give new members is to stay the course no matter what. We live in a society where people are used to working 2 weeks and getting paid on Friday. As entrepreneurs, it doesn’t work that way. We might have to put in weeks, or even months, of work before we start seeing a payout, but if you’re committed and consistent, money will start to come in. It trickles at first, like the beginning stages of rain, but with consistency, it turns into a steady stream of income that keeps growing over time. And usually out of nowhere, the flood gates open up. It seems like you’re making more than you ever thought you would and you’re wondering why you ever thought it was difficult in the beginning. This isn’t always the case. Some people make money right away, but the way I described is the way it usually happens for most people because you have to account for the time that it takes you to learn and develop. I was afraid I’d get discouraged, so to make sure I didn’t quit, I paid for a year in advance so I knew I’d be at least committed for a year (plus it saved me a lot of money). Best investment I ever made. Good review! I have been a member of WA for a little over 6 months and I think joining this community has been the best commitment I have ever made! I will be honest, due to the process of earning a good income through this being slow, there has been times where I tried joining other things in hopes of speeding up the process. And just like with how you mentioned, no matter what, I always ended up bouncing back to WA because the urge to continue this was much stronger than walking away and trying a bunch of things at once. Out of every training program that I have tried in the past, the training here is definitely the best! I found it very easy to understand and there were very few times when I got stuck, not just because of the training itself, but also because of the active community. I especially like the fact that starting your own website through WA’s platform is super affordable, compared to most other site builders, from what I heard. At the moment, I have one site up that I am currently building that promotes stuff mostly through Amazon and eBay. However, I would also be much interested in having another site up to promote WA, as I am a strong believer in the program, and I could see myself recommending it to others, including family members! My question is, how long have you been a part of WA and what advice would you give to someone that is just starting out? Thanks, Isreal. Yes, a little reminder of your Why is always a good thing. This review is just spot on! If I wasn’t already a proud member of this amazing community I’d join right away! I really love WA member’s philosophy of paying-it-forward by helping each other. It really helps to have the helping hand of somebody who have been there before you and can save you some of the trouble they went through when they started online. Thanks for reminding me why I joined! Thanks Weston! I appreciate the feedback. Awesome review! I joined Wealthy Affiliate in March of 2017. Like you, I also liked the fact that it was completely free to join. I had never seen a free membership offer that didn’t at least require my credit card information to sign up. I had nothing to lose when trying it out for a while. But I quickly realized that the premium membership was completely worth the small fee. WA has everything a person needs to succeed online. I’d recommend it to anyone at any level of expertise. Thank you for promoting such a trustworthy opportunity.